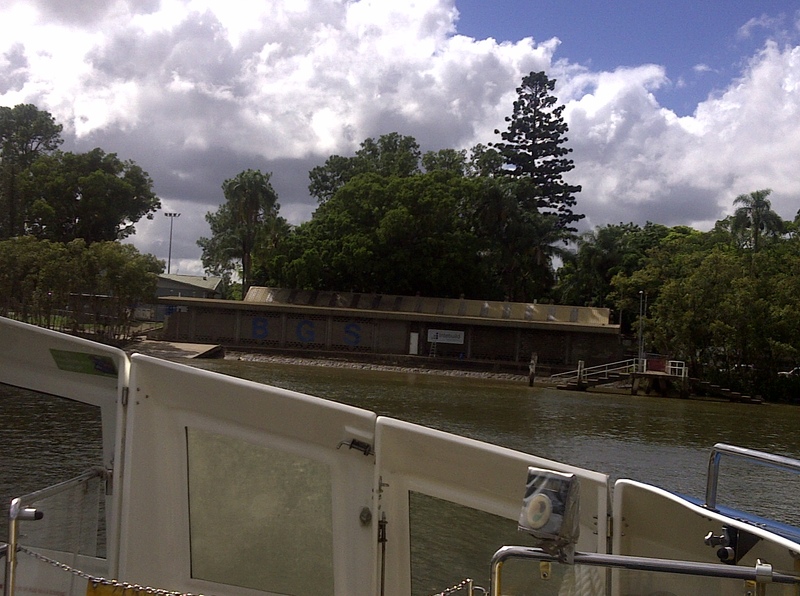 This morning, at the request of 4BC Radio, I found myself heading down to Guyatt Park in St Lucia to board a City Cat. Why you ask? But first, some back story. 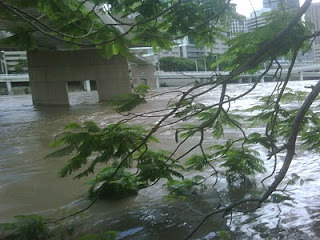 If you haven't heard about it, perhaps you were living in a cave, Brisbane suffered its worse flood since 1974 on 13 January 2011. 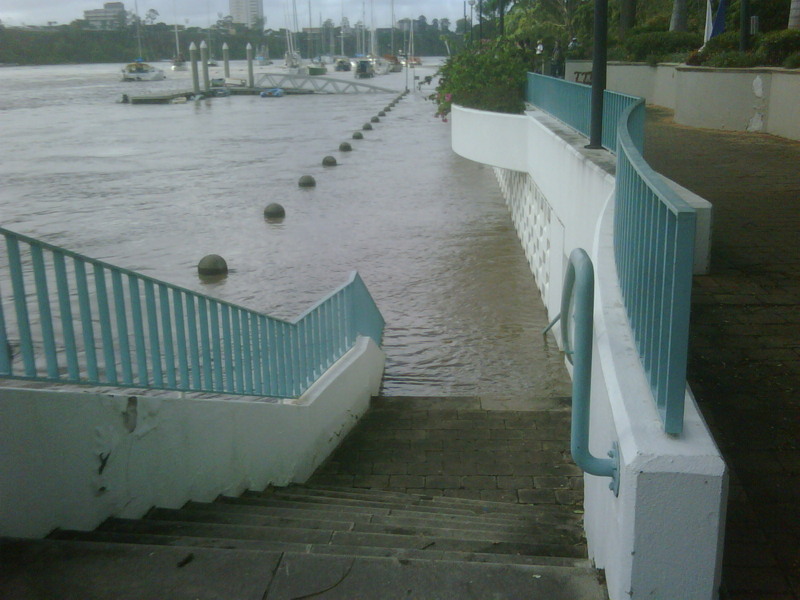 The usually calm Brisbane River took on a life of its own and became an angry torrent, taking out anything that tried to stand it its way. It didn't matter if you were a pontoon, a boat or even a floating restaurant. The river was coming to get you. Mansions along the river, older homes, warehouses, unit blocks, bridges, roads, paddocks, the river did not discriminate. It either pulled things loose and took them with it or it forced its way inside buildings, stripping walls and destroying everything as it rose. Brisbane's flooding started literally days after unprecedented tragedy on the Monday of this same week in the peaceful Lockyer Valley. We would witness scenes beyond belief. 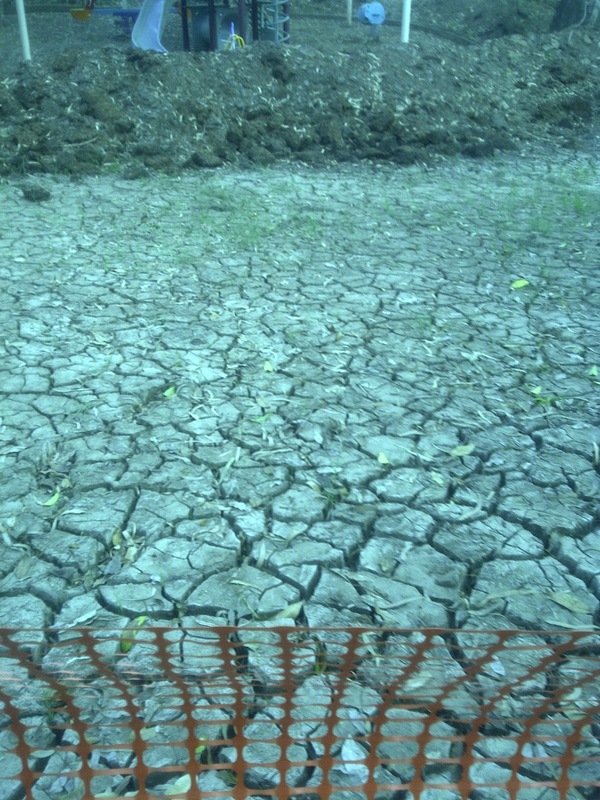 We would see Toowoomba, Grantham, Murphy's Creek and other towns in the Lockyer Valley engulfed by a wall of water hundreds of times angrier than the Brisbane River. Lives were lost. Homes were ruined. Business decimated. 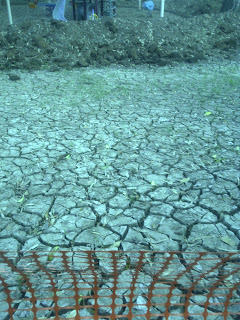 Crops and stock wiped out. Lives shattered. Life in the Lockyer Valley will never be the same again. We watched the television open mouthed and speechless as we saw vision of houses floating away, people stranded on cars roofs, clinging to each other on top of their homes and hanging onto trees. All while the torrent of angry water swirled around them, threatening to take them too. We saw bravery and courage as people put their own lives in danger to save others. We saw so much sadness as we watched lives being literally washed away by walls of water. The absolute shock and horror at what was happening was hard to take in. It is still difficult to comprehend. Last night, 60 Minutes reporter Michael Usher spoke to a family from Grantham who have lost more than anyone should ever lose. They lost their 18 month old daughter. They lost both their mothers. Their two remaining children lost both their grandmothers. They lost their home. They lost life as they know it. What they do have left to hold onto is love, strength and each other. We also saw incredible human spirit. Such an amazing outpouring of love and generosity of which I have never witnessed in my lifetime. A month on we are still seeing this human spirit. I don't live in a flood affected area. I guess you could say I'm one of the lucky families. In fact many of us in Brisbane were not flood affected. It was difficult each day knowing that whilst we still had all the comforts of home, including electricity and food, many families in our city and other towns had nothing other than the clothes on their back. I suffered survivor guilt and I know many others did. It felt wrong to still have everything whilst so many had nothing. I'm sure this assisted to spur on the tens of thousands of people who volunteered their time and donated money and items to help our flood affected families. A month on and help is still forthcoming. This is human spirit at its very best. Now, back to the City Cats. 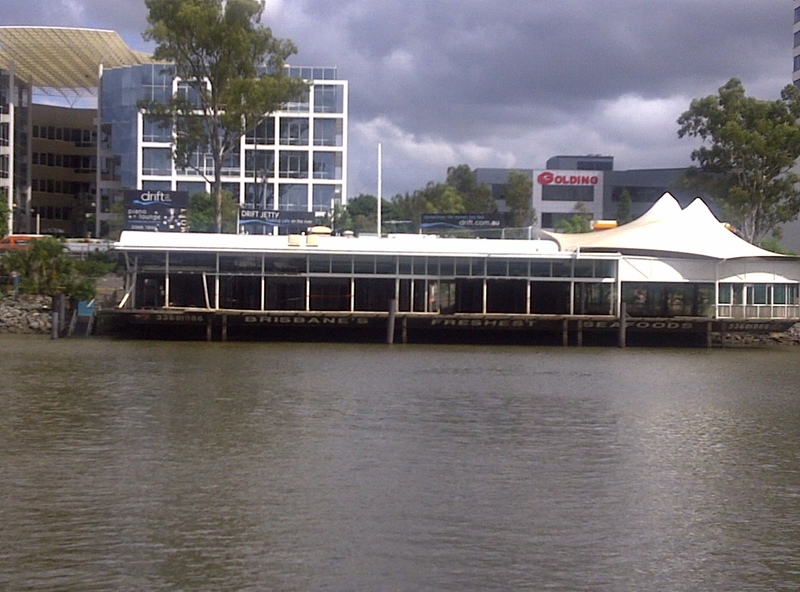 If you live in Brisbane you will know that from today, some of the City Cat fleet started work again on the Brisbane River. Our City Cats and some of the City Cat terminals were damaged during the floods. Many of these have been repaired and some of the terminals restored, ready for business today. I headed down to St Lucia, battling my way through typical Monday morning Brisbane traffic. It wasn't pretty. The roads were extremely congested as people were making their way to work and school drop offs. My mission was to take a ride on a City Cat and do a live cross for the Breakfast show. As I drove into Hiron Street, which leads to Guyatt Park where the City Cat terminal is located, I didn't notice much evidence of the recent floods. However, I know that hidden behind fences and brick walls the muddy devastation was still there. 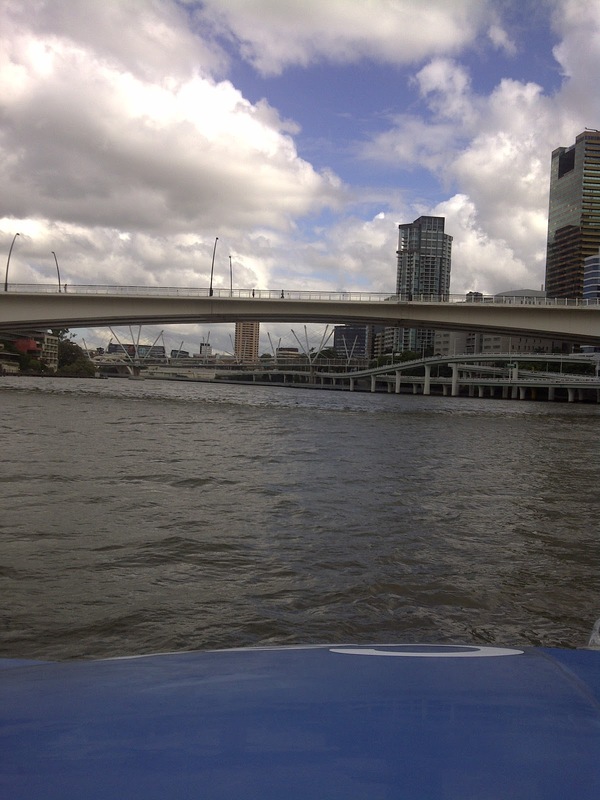 I quickly headed to the terminal and jumped on a City Cat which was ready to leave. I didn't really notice any residual flood damage and it wasn't until I returned and had a closer look that I could see evidence of the flood. This evidence was in the form of thick, dried mud. It was everywhere. 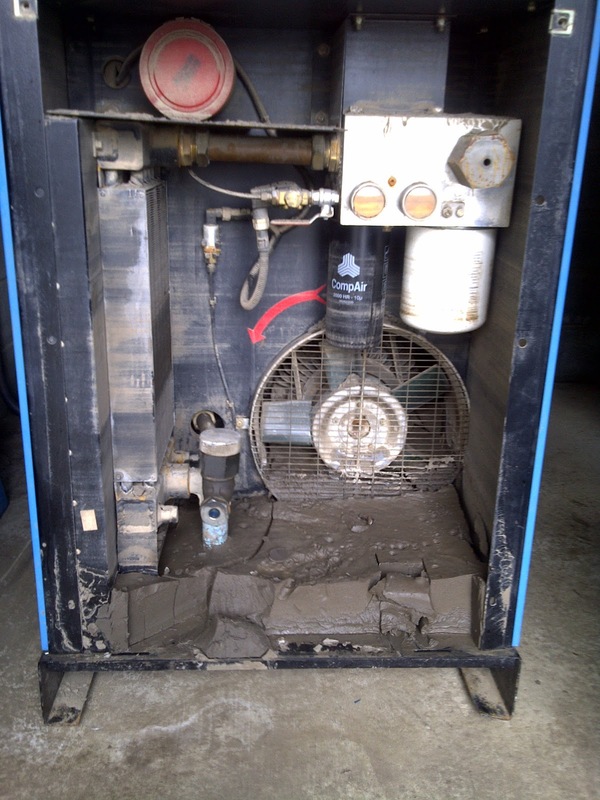 Look at the thickness of mud in the bottom of this unit! It did have a front cover on at the time of flooding. Travelling down the river this morning was beautiful. It was a far cry from the angry torrent she was on 13 January. She is still brown, but with a hint of sparkle. For many weeks the river was a dull, thick, muddy brown colour. Not so much now. Along the banks the mud paint was almost gone. If I looked closely I could see some houses were uninhabitable, but generally the river had that familiar look I remembered. The saddest part of my trip was going past the Drift Cafe. 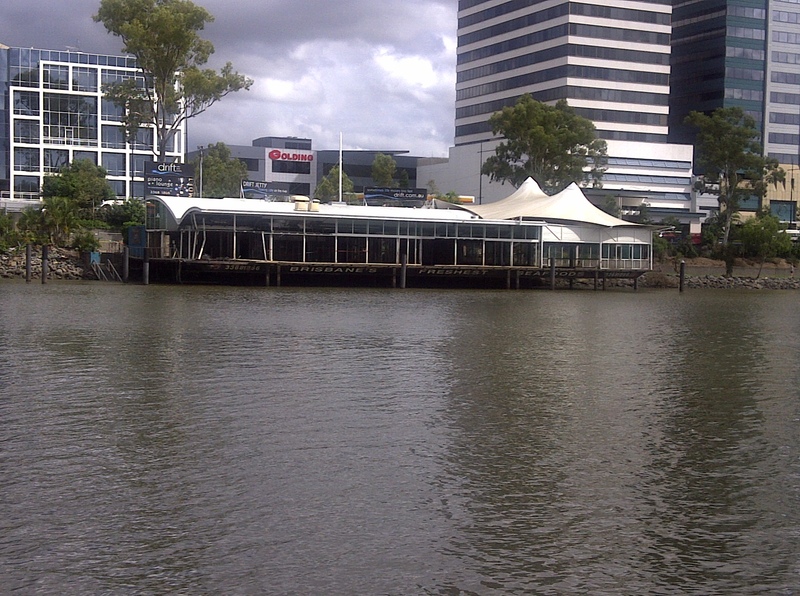 This iconic Brisbane Restaurant literally sunk to the bottom of the river. 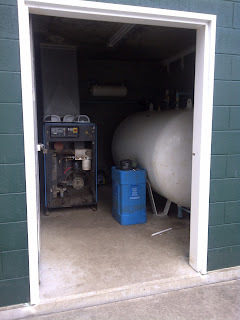 It has since been raised up and almost gutted. The owner is determined to have his restaurant back one day. We hope he does. One month ago this city was in absolute chaos. Lives were shattered. People were lost and dazed. Thousands of people were displaced and it felt like life would never be the same again. For many it is still a long way before life is even close to how it was. For many it never will be. As I was travelling down the river on the City Cat, I experienced Brisbane's "new normal". A normal which is different to how things were. I was experiencing the post 2011 floods normal. I felt an incredible sense of a city just "getting on with it". It feels like Brisbane has rolled up its sleeves, picked up its shovels and is getting on with the business of cleaning up and living again. I felt proud of my city. Thanks so much for your views, both literally & in writing. It might have only been a month ago, but the tragedy..the tv shots...& all happening via twitter & FB more quickly than ever. I recall that you, chuffed with a full time producer's job for 3 weeks, had to hit the ground running! No easy starts or short days..whenever I did see a tweet from you, it was a flood related/news radio/help needed or offered. None, unless i or others enquirer, were personal because your focus was 100% in serving those who were suffering in all sorts of ways. Now, as you've said, you can finally write about it..and you've journeyed on a benign river using a familiar craft..and let your listeners know all about it. Thanks for helping a Sydney-sider "get it" too! Annie, subject matter aside (but not diminished! ), you write so well. Your evocative prose takes me along with your story every time. I always make it to the end, which - with an attention span like mine - is not a given. And now the subject matter... as Denise said, thanks for helping Sydney-siders get it. Both at the time and now. What a beautiful post. Although I am a foreigner now living in Brisbane - I am so proud of my new home. I am amazed at what has been achieved in such a short space of time. I love that what has been left behind is not the devastation and sadness but rather a sense of community. Such a great perspective, Annie - and written so beautifully. I can't wait to get back on the river! And it's so important that those of us lucky enough not to be affected by the floods continue to support those who are still struggling - for many it will be a long road back to feeling any kind of normal. Thank you! 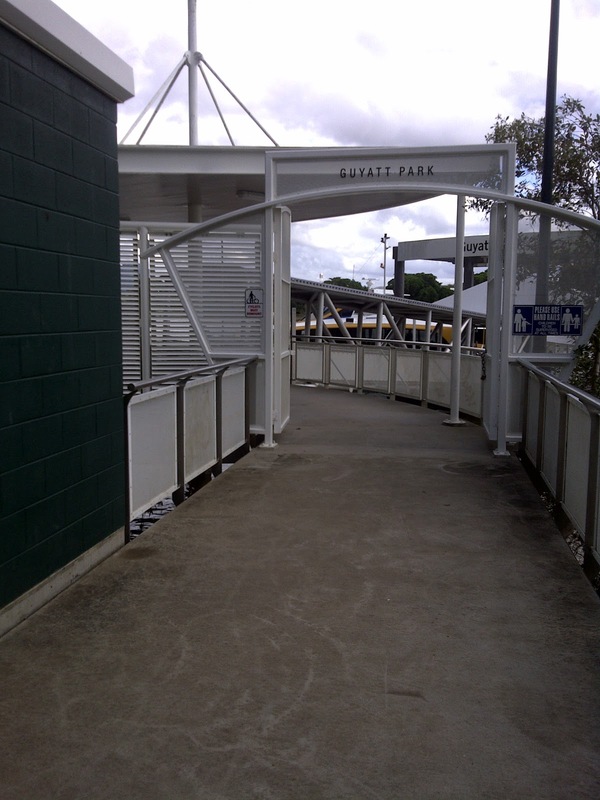 Wow, you have caught the essence of Brisbane so well. I watched 60 minutes last night and just don't think I could fully comprehend the story. Surely this didn't happen an hour away from me? I am amazed that the Citycats have been resurrected so quickly..especially as the terminals were reported as being so damaged and loosed from moorings! I am surprised that you didn't see more damage on your trip too. Thank you Annie for your great commentary about the state of the river and your journey. It's true, experiences like this can bring out the best in people, and produce an admirable fighting spirit. 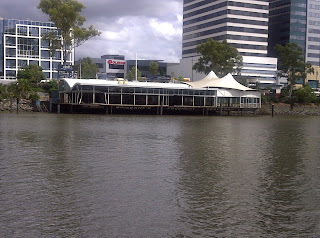 I'm quite sure that for many new Brisvegans, the flood has provided a shared connection, a bond on which to build a sense of belonging. For those of us born and or breed here, it has given us a deeper love. Beautiful post Annie - thank you for sharing this with us. 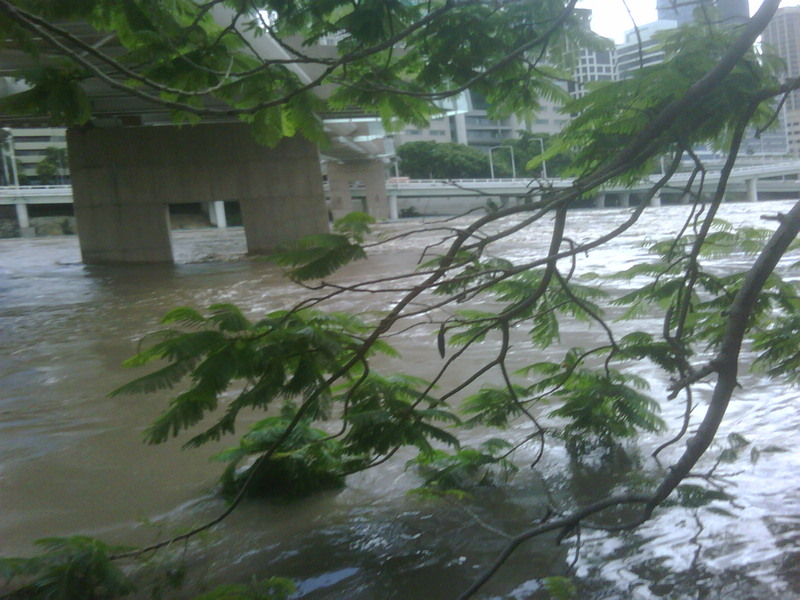 Hi Annie - thanks for such a beautiful 'verbal picture' of post-floods Brisbane. I think your comments re survivor guilt reflect what so many of us were feeling. So far away. So helpless. Oh I really enjoyed travelling the City Cat with you Annie. Brisbane and it's people are doing such an amazing job getting back on track. Loved seeing Brisbane from your articulate and evocative perspective Annie. So incredibly tragic and powerfully brave at the same time. the juxtaposition will stay with us all I think. Thanks for sharing Annie. No pics necessary your words say it all. I think I need to visit.